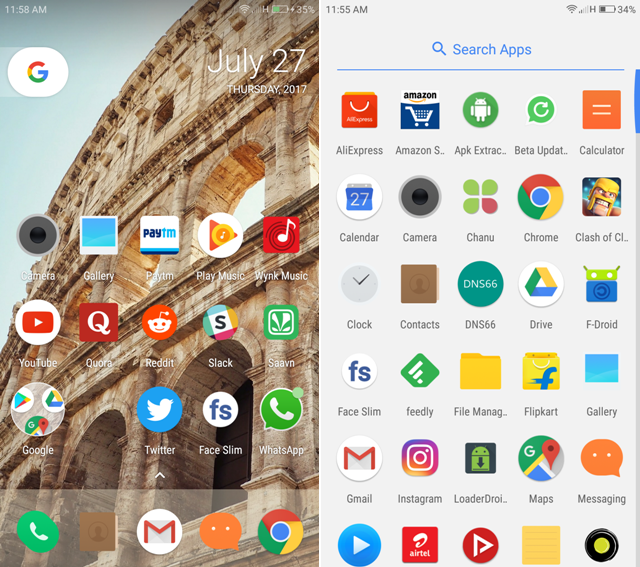 One of the best features of Android is Customization and that can even make it look like iOS which has almost zero customization options. But, Android vs iOS is not our topic today nor it’s about the mainstream Android launchers like Nova, Apex or Evie. Today, we will take a look at some fresh Android launchers which are definitely worth a try. If you’re an admirer of Google’s Material UI like me then you will like this launcher too. 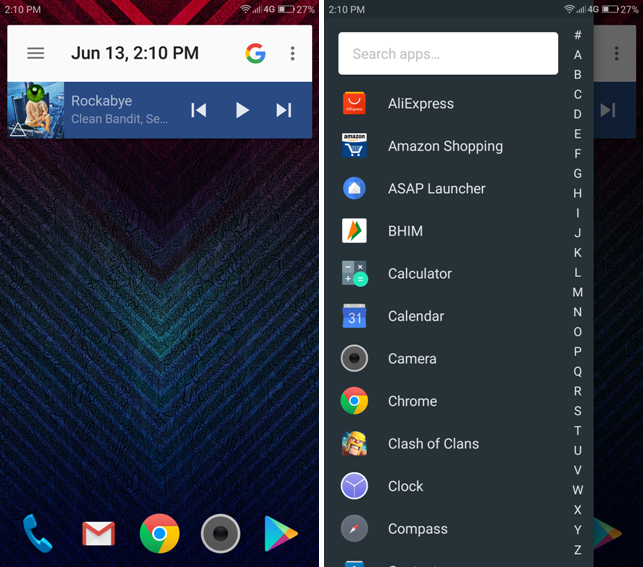 It’s a pretty clean launcher with gesture support like Nova launcher, the home screen features a dock which on swiping up shows more apps, like action launcher. The app drawer can be accessed by swiping from the left edge and the toggles like WiFi, Bluetooth etc can be accessed by swiping the right edge and swiping left or right on the home screen, not on the edges, opens different cards like contacts, weather etc. 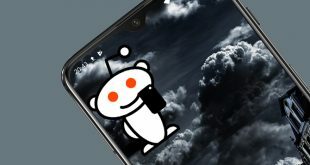 The free version of this app comes with only basic theme support but for using icon packs, other themes and unread badges support, you will need to buy the Prime version which costs about $2. I found this launcher pretty innovative in terms of changing the home screen layout. It shows every app on home screen, so if you have a lot of apps, they will get quite small. When you will hover over the home screen, app icons will enlarge, I think that’s why the name is Lens and for opening any app, you have to just stop on it while hovering. You can even hide apps from the home screen, change the icon pack. It’s free, has zero ads. This launcher is for those who install a lot of apps on their smartphone. Its home screen features a keyboard to quickly search for an app or a contact. You can even change the icon pack, the app drawer’s layout etc. It’s a clean launcher with a pretty fast search operation. Note: just make sure the “Unknown Sources” is ticked in the settings. As the Pixel Launcher is exclusive to Google Pixels and side-loading it gives us a gimped version of the app, which doesn’t have features like Google Now Panel and G Search Pill. 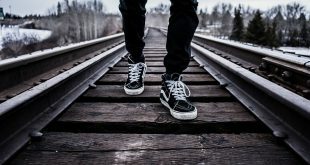 As these features require the app be installed as a system app and being installed in Pixels as system app makes these features exclusive to them. 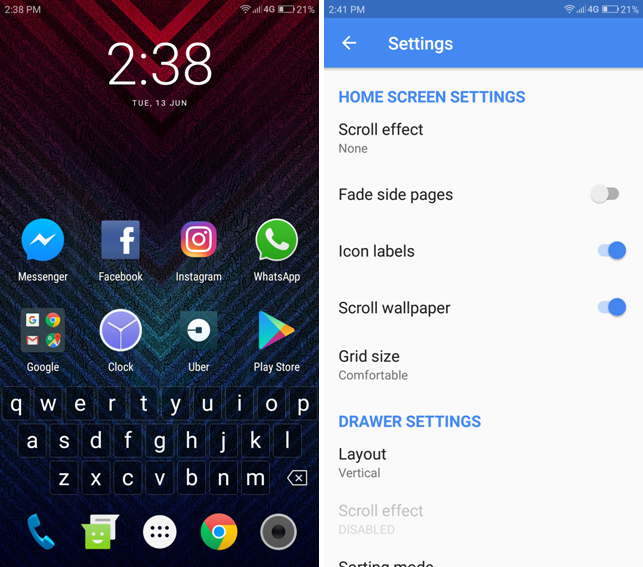 A developer named deletescape has ported Pixel Launcher and all its features to all unrooted phones, it’s called Lawnchair. It also has some extra features to like icon pack support, app hiding, adaptive theming, gesture support, and many other UI tweaks. And the icing on the cake, it also has Android O feature, Notification Badges. The launcher is fast, responsive and works great. 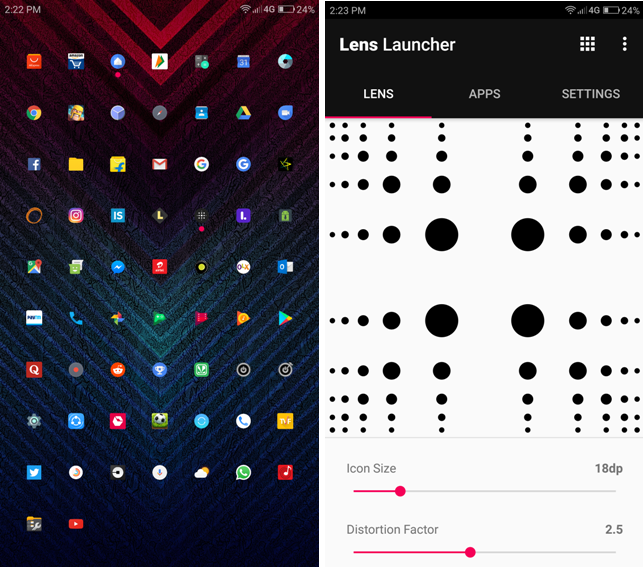 If you have installed a lot of apps and have trouble finding some, use the FastKey Launcher, if you like the Material UI then try the ASAP Launcher, or if you were a fan of Pixel Launcher but can’t use it now then you should try the Lawnchair but if you want to try something unique like I did, then try the Lens Launcher. Let us know which your favorite in the comments.